Salman Khan plays Pawan Kumar Chaturvedi alias Bajrangi Bhaijaan, a clean hearted simpleton, a Hanuman bhakt with loyalty inherited from his father towards RSS. And he is refreshingly not the typical dude ready to throw punches in the air at any moment guy. On the contrary, he is the antithesis of a typical Salman Khan character; he is modest, peaceful and bows down even when he spots a monkey. Pawan meets Rasika (Kareena Kapoor Khan) when he comes to Delhi from UP to stay with his father's friend's family. His idyllic, simple life takes a turn when he encounters a six year old child, Munni aka Shahida (Harshaali Malhotra) from Pakistan and he takes it upon himself to return her to her family. So we can say It’s Shahida’s story, a sweet, spirited 6-year-old Pakistani girl who loses her way in India. Lost, hungry & lonely, she begins to stick to the enthusiastic Hanuman devotee Salman Khan; Pawan Chaturvedi, also known as Bajrangi. Unable to shake her off, Pawan, who is not good at anything other than being a good, honest human being, takes her home, not knowing that she is Pakistani and a Muslim. The love of his life, Rasika (a gorgeous Kareena Kapoor Khan), decides to help Pawan in sending the little girl home. Never saying a word, but always communicating with her emotive eyes, Pawan develops a special bond for this kid. Circumstances compel him to cross the border illegally to find her parents. In the process, his paths cross with a small time freelance TV reporter, Nawazuddin Siddiqui, who joins the two in their search. What happens next is definitely predictable, with dollops of populist peace talk thrown in. The film’s best performance, undoubtedly, is that of Salman Khan. To play this part, he has left behind his signature over the top gestures somewhat; he is measured & endearing. 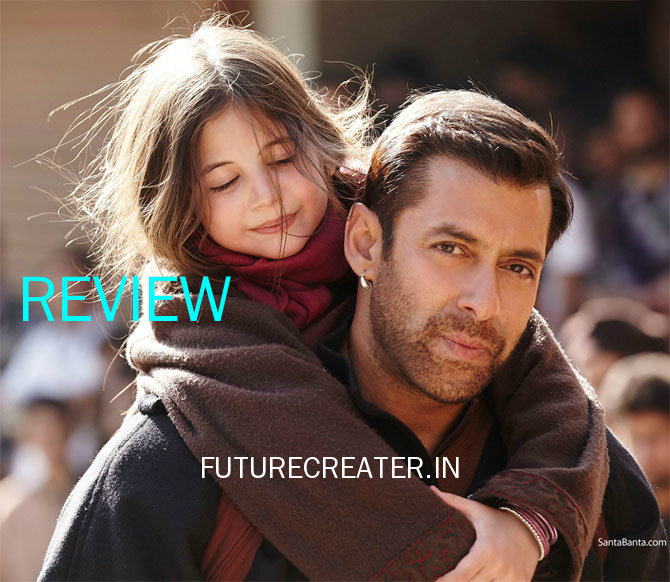 Harshaali Malhotra is lovable & convincing; with a naughty, bright smile that speaks volumes. Nawazuddin Siddiqui is brilliant and brings a wholly different energy to this cast. Kareena Kapoor Khan, in a short but significant role, is perfectly suited for her part. Supported by a decent cast of character actors including Om Puri & Rajesh Sharma, they lend credibility to this obviously commercial script with huge leaps of faith. The script has flaws. It has leaps of faith, like humane border security guards. But it’s core story- that of Bajrangi’s love for this little girl and his promise to take her homes against all odds- is consistently narrated. The film’s cinematography by Aseem Mishra stands out for flourish, scale & splendor; rarely have barren desers and mofussil towns looked magnificent in their rawness. Editing is in sync with the story. This movie portrays secularism in an un preachy, fun way. No taxing jingoism, no chest beating dialogues, instead you are served self-effacing humour and smart lines (Dialogues by Kabir Khan and Kausar Munir). Nawazuddin, who's trusted to make his characters most believable is perfectly cast. little Harshaali Malhotra who will steal your heart with her angelic face and evidently natural talent. At 2 hours and 25 minutes, Bajrangi Bhaijaan is long. Its stretched climax is custom made to fit the pattern of a formulaic Salman film.The exaggerated climax, however, seems to drag a little too long. A full filled emotional entertainer that all will love. This film is a must watch for lovers of pure Hindi commercial cinema and family audience. Somehow South Indian Blockbuster ‘Baahubali’ will make a negative impact on box office. Salman Khan itself said that in recent press meet, But we don’t think so. Any way story wise “Bajrangi Bhaijaan” is better than “Baahubali”. So most probably “Bajrangi Bhaijaan” will breaks the successful running of “Baahubali” in theaters.